From Dobrá Voda, you can join the red-marked trail just behind the church, and you’re very quickly alone in the wilderness again. The absence of other people hiking in this area in this area is a real pleasure if you are looking for some peace of mind, but it’s also a novelty: such a gorgeous hike in the UK would have you passing at least a few other walkers en route. Look out along this stretch for wild cherry trees, a welcome treat when you need a sugar kick and some vitamins! There are also plenty of raspberries, apples and pears along the way, although those were out of season for us. You’re now back in the forest for a few hours. This is a very pleasant part of the walk, and relatively flat, so you’ll be able to cover ground quite quickly. Being so expansive, however, it’s quite easy to lose the trail and you might find yourself doubling back, or cutting across to it as you spot a mark in the distance. After a couple hours you’ll eventually find yourself walking down a road, a sure sign that civilisation lies near. Make sure you follow the trail here through the residential streets into the town of Brezová pod Bradlom. We arrived desperate for some lunch. Though there seems to be a couple bars in the area, the only place that served any food was a small ice cream parlour and a bakery. Fortunately, the locals came to our rescue and pointed out the only restaurant open, right next to the local Tesco! Here we manage to feast on a delicious two course meal for €3.50, a bargain! This was day four of our Slovakian adventure. Our feet were swollen with blisters, our shoulders were aching from the weight of our backpacks and tent, and the 30-degree+ heat was crushing us. We were beginning to have doubts that we would actually reach our goal of getting to the Pohoda festival entirely by foot from Bratislava. Though the mountains are relatively small (all in the Malé Karpaty range are under 1000m) the trail can be very tiring, as it rises and falls very often, and rarely stays at the summit. We were limited by time (7 days to get to Trenčín, Pohoda’s location) and so each day (i.e. each of the stages 2, 3 and 4 previously described) had been filled with about 7-8 hours of walking. For those who are disheartened or simply want to end their trip here, there is a bus station here with trips back to Bratislava (although even the disheartened should at least make it to the top of Bradlo, above the town, for incredible views from the historic monument there). In any case, we were not to give in so easily! We downed a coffee, gathered up some willpower, and headed back into the hills. Once you reach the monument to General Štefánik, at the top of Bradlo (Bradlo is often how the whole area gets referred to as), about an hour from Brezová pod Bradlom, you’ll find a herd of tourists who have driven up to the landmark. You’ll be able to take in the amazing views just like that of the lead image in this article, not to mention the cool breeze: admiring the mountains that lie behind you and the route you’ve walked up to that point (the whole trail from Hrad Devin at the beginning of stage one to here is thus far some 120km). If you choose to continue along the red trail here, you’ll be leaving the Male Karpaty (Little Carpathians), and heading through some flat farmland to the Biele Karpaty (White Carpathians). From this point onward, the Štefánikova Magistrála ends and the trail is just known as the Cesta hrdinov SNP: continuing all the way to the Dukla Pass in Eastern Slovakia. After Bradlo, perhaps the only point of frustration comes a few hundred metres past Jandova doling when you’ll enter a huge open expanse with absolutely no indication of where the trail continues. Some trial and error may be needed: and trying any option involves walking to the nearest tree, a good 10 minutes walk away on every side of you. After a lot of trial and error, we finally found the path leading up, a sharp right from where it suddenly ended. This next swathe of the trek is flatter and you’ll be walking through the village of Polianka, amongst others. This is more open country, here, and the scenery is truly spectacular. As we had found in most towns in these parts, the houses are very pretty and people seem to live comfortably. Wherever we went, we were met with looks of surprise, but also with smiles and greetings. Jonno Tranter is a freelance graphic designer and illustrator who lives in Bristol, UK. In his spare time he likes to write, have adventures, and attend music festivals. This year, he decided to combine all three into an epic trip across Slovakia! Read more about him on his online portfolio (and on stages two to five of our series of features on the Štefánikova Magistrála trail – for Jonno, part of a gruelling adventure which saw him hiking from Bratislava all the way to Trenčin: discover it through the links below). Plus: More on the Cesta Hrdinov SNP Trail from Bradlo on towards Dukla – coming soon! We arrived at Pohoda festival exhausted, dirty, and deprived of social interaction, having hiked all the way from Bratislava along one of Slovakia’s most beautiful long-distance trails. Fortunately, the festival was to provide the cure to all our woes. It seems that everyone here really loves this festival: it’s their baby. We were told by several folks that Pohoda’s relatively high entrance fee attracts only the crème de la crème of Slovakian people, and you won’t get anyone here who wants to rob you or start a fight. While this may seem a little smug, it’s true that everyone we met at Pohoda was incredibly warm and welcoming. The festival is spread around Trenčín airport, where small planes still regularly use the airstrips just outside the festival grounds. While the area is very flat, the Biele Karpaty to the East and the Strážov Mountains to the west surround the festival, providing amazing scenery, especially for the sunsets and sunrises. We didn’t hear much English spoken at the festival, and it seemed that over 90% of the attendees there were Slovak or Czech, making it a great opportunity to meet locals. Upon entering the festival we headed straight for the showers, and were pleasantly surprised to be offered free shampoo and shower gel – not something you would expect in the UK! The toilets also seemed to stay reasonably clean throughout the festival: in the UK that’s not so common, either. Pohoda is really the perfect size. Walking from the main stage to the Orange Stage, at the other end of the festival, takes less than ten minutes, so it’s easy to catch all the acts you plan to see. There are eight stages in total, with many other tents offering a plethora of activities, from silent disco to roller blading, speed dating and tightrope walking. There’s plenty to keep the kids busy too, and the festival seemed very family-friendly. For the foodies, there’s a decent selection, catering to vegetarians and vegans, but also with plenty of Slovak and Czech options to choose from. At night, Pohoda lights up, the kids go to bed, and the alcohol really begins to flow. Don’t expect cocktails and shots though, stalls and bars only sell beer, cider, and wine, apparently to minimise drunkenness and aggressiveness. Guests are permitted to bring their own, however, and anything in a plastic bottle will be good to go through security. The music carries on officially until 5am, but with the sun rise at about that time, you’ll find pockets of activity everywhere. What really makes Pohoda stand out amongst a saturated European festival market is it’s lineup. On the Saturday night at what was the 20th Pohoda, we managed to catch James Blake, The Prodigy, Flying Lotus, and DJ Shadow, all in the space of about 4 hours. That’s a really incredible musical evening! Nevertheless, it seems that many guests aren’t too fussed about planning their night based on whom they want to see. A good few seem to trust the organiser, Michal Kaščák, and his team’s taste in music – enjoying wandering from stage to stage and discovering new talent along the way. The quality of the sound at Pohoda was also impressive, and Sigur Rós have since stated that the sound quality on the main stage was the best they’ve had during their whole tour. The July heat does get to you at Pohoda, and you’ll see many sunburned people by the end of the day, so make sure to bring your sunscreen! Sleeping beyond 9 or 10 am is not really an option as you’ll be sweltering inside your tent, and there are no places to camp under the shade. However, this simply means that all Pohodans do what they do best during the day: chill. Pohoda means “relax” in Slovak and everyone seems to be happy finding a grassy spot to lie down in the shade, while making little escapades off for food and drink, and to sample the delights of the day. With an amazing lineup, affordable prices, beautiful scenery, great weather, and a positive, relaxed atmosphere, Pohoda ranks amongst the best festivals in this part of the world. With flights to Bratislava so cheap from the UK, it’s a wonder there aren’t more Brits here. But shhh, don’t tell too many people, it’s perfect the way it is! Jonno Tranter is a freelance graphic designer and illustrator who lives in Bristol, UK. In his spare time he likes to write, have adventures, and attend music festivals. This year, he decided to combine all three into an epic trip to Slovakia! Read more about him on his online portfolio. Imagine it: a delightful medieval castle town in Western Slovakia with a buoyant arts scene on the cusp of where two of its main ranges of hills, the Malé Karpaty and the Biele Karpaty, come together. The town in question is Trenčin, the quirkiest parts of which are going to get a lot of publicity on this site – and indeed already do. Here (well actually just outside, on the old airport, which boasts great views of said hills) every July, Pohoda, one of Europe’s greatest music festivals is held. Pohoda was celebrating its 20th year in 2016, and it’s important people realise what that means. After Slovakia became an independent nation in 1993, this festival really helped put Slovak music and culture on the map. Founder Michal Kaščak started Pohoda when no one knew anything about the country except during the time when it had “Czecho” at the front of it. He started it when times musically in Slovakia were fairly sterile and he built it up into a festival which is at least as important in Central/Eastern Europe as Glastonbury is in the UK: and it is now the biggest and best music extravaganza in this part of the continent, with rock to dance to classical to folk to electronic all (and always) represented with panache. That’s really no exaggeration: acts such as the Prodigy, Gogol Bordello, Roots Manuva and Nick Cave helped establish Pohoda as a fixture on the calendar of Europe’s coolest festivals during the last decade. It’s not just international acts: lots of Czech and Slovak groups (the Slovak Philharmonic Orchestra are always astounding when they come on) feature annually too and often wind up being the most incredible surprises of the entire weekend. And it’s not just the music, either: it’s also an advert for Slovakia’s alternative foodie scene, and a mouthpiece for many voices in Slovakia that rarely get heard from environmental to human rights groups. As far as the music is concerned, funny we should mention those first two acts. Because for the 20th edition of this party, the Prodigy and Gogol Bordello returned to Pohoda! Meaning 2016 had one of the best festival line-ups thus far – and paved the way for even greater line-ups in the future! Anyway, Pohoda is no longer just in the category of annual event. It’s in the category of institution! And it’s thoroughly worth using it as a reason to visit Trenčin and this corner of Slovakia. 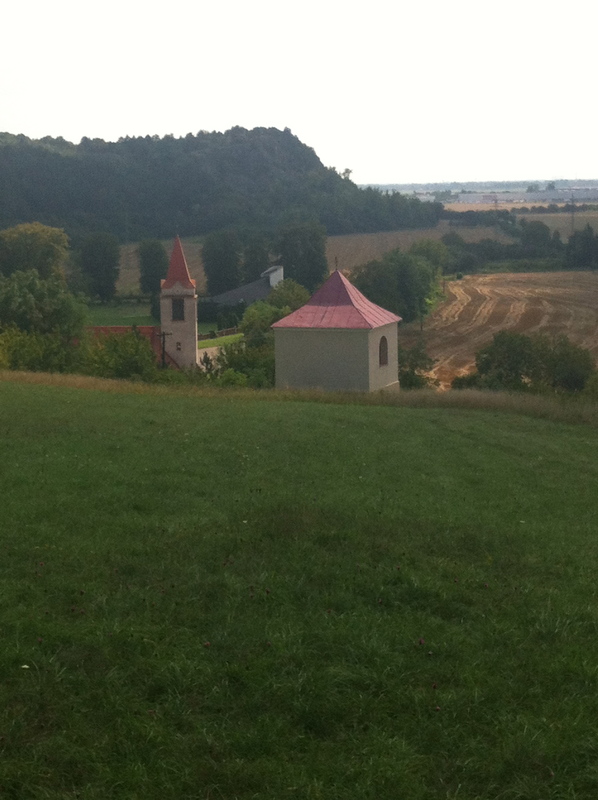 On this site, we’ve already got a bunch of content to help you with your visit to Trenčin! I remember, sure, the first time I left the beloved Southwest England of my childhood for a long while, but oddly enough, what I remember more vividly is returning to it again after that first lengthy absence. The Berry’s Coach out of Hammersmith bus station in the afternoon winter murk, the London suburbs falling away, the neat commuter belt semi-detached houses and slowly, the fields and woods rearing up into what I call true countryside, right around Stonehenge. Passing Stonehenge for me was always a sign of coming home, but it was also representative of the beginning of wild England after being cooped up in the city. There are a myriad Stonehenge’s, in this sense, around the world: points that mark where wilderness wins the tussle with city sprawl and out-of-town business parks; points that make me, personally, feel truly human. 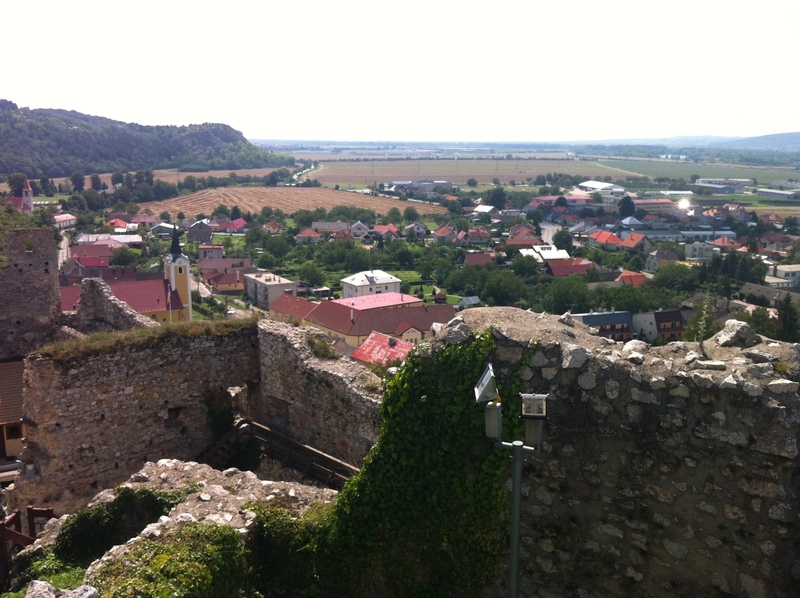 Hrad Beckov, or Beckov Castle, is for me that point in Slovakia. And it is one of the nation’s best and most poignant fortresses. Beckov shares with Stonehenge that gobsmacking, surely multiple accident-causing location off-side of the main west-east road from Bratislava to those really exciting parts of Slovakia’s nature (Malá Fatra, the High Tatras, Slovenský Raj and the far eastern Slovakia). In fact, in honesty, it’s many times more impressive than Stonehenge. Were this dramatic ruined castle placed anywhere in England, it would be swarming with crowds, and tour buses. Not so with Beckov. The lack of crowds is one of the great joys of life in Slovakia, as I have said several times on this site. But even by the standards of what constitutes crowdedness here (this is a nation, remember, where more than twenty cars moving at reduced speed on a main road is considered a tailback), Beckov is not overrun with visitors. On a summer Saturday midday we were among perhaps 15 other people roaming the ruins. Ruins, I should add, that you can get right up to and touch, unlike Stonehenge. After that stunning first glimpse of the castle straddling a sharp crag a few kilometres shy of Trenčin, looking like some besieged prop from the Lord of the Rings, you take the Nové Mesto nad Váhom exit (before the castle) and arrive in the diminutive village of Beckov via routes 515/507. At the main village “triangle” there’s a small cafe doing rather alright ice cream and offering a little terrace to partake of it on. But save the urge for something sweet until you’re up at the castle – the approach road to which is just south (right) from here. On the way you pass a Jewish cemetery in a wild state of abandon, before climbing up to the left to the custodian office (in-English historical leaflets available), where you’ll part with the entrance fee of 3.50/1.70 Euros per adult/child. The route initially leads to a wide grassy forecourt below the base of the craggy upper part of the castle, where there’s a souvenir shop (knight’s armour, anyone?) and an amphitheatre of sorts where maidens in medieval garb explain the castle history for those that want it and offer tours of the ruins in a rather fun way. There are also demonstrations of Slovakia’s blacksmith craft. For those that don’t want to wait for the explanations of the medieval maidens, and who aren’t interested in Wikipedia’s cumbersome but quite informative article on the castle’s legends, the gist of Beckov’s past is that to understand it is to understand the rather infamous local character of Mathias Čak. The area’s all-time top persona non grata, Čak made waves in the medieval Hungarian Empire by proclaiming his own empire, pretty much, in what today is Western Slovakia and Northern Hungary. He was a powerful and power-hungry warlord that, whilst looking out exclusively for his own interests, gave this region an absolute, if short-lived autonomy from about the year 1296 through to his death in 1321. Fair play to the man: during these two decades even the King of Hungary, despite a couple of attempts, could not oust Čak from his lofty perch. Many of the Western Slovakian castles, including Červený Kameň, were under his command during this time (although the guys over at Gýmeš Castle were his enemies), and Beckov, at the time a relatively new fortress, was his too. After Čak’s death, the castle was passed between various lords and, just before fire destroyed it in the 1720s, served as a prison. The upper levels, accessed by returning to the forecourt, are a must to explore – great for the kids, with several nook-and-cranny rooms. One of these contains a dragon – I joke not, one yields superb views of Beckov village and the Biele Karpaty, one is the remains of what at one time was considered Central Europe’s most beautiful chapel, and one contains one of Slovakia’s coolest teahouses – a little place where you can also grab a cold beer and a slab of strudel, for insanely cheap prices. Gazing down from, or up at, Beckov’s precipitous walls today, its not hard to understand how, in over four centuries, the castle was never breached but succumbed in the end to fire rather than attacking force. If you’ve the time, back down under the custodian office a track bends left to another interesting sight: a scale model of the castle in a recess in the rock. You can continue from here, along a vaguely-defined path along a ridge, passed an old watch tower to descend to the road where your car is parked on the edge of Beckov village. ADMISSION: 3.50/1.70 Euros per adult/child. On a surreally misty grey morning the other weekend we drove up into the northeast portion of the Small Carpathians (Malé Karpaty) not far from Trenčin to find out a little more about the most famous Slovak personality of the last 115 years, Milan Rastislav Štefánik. Štefánik, one of the most influential figures in the founding of the Czechoslovak state after World War One, was born up here in the pretty village of Košiarska, cradled in a pea-green swathe of grazing land between two forested ridges. A whitewashed gaggle of cottages in the village, including the house he grew up in, is to this day a museum dedicated to the man’s life. 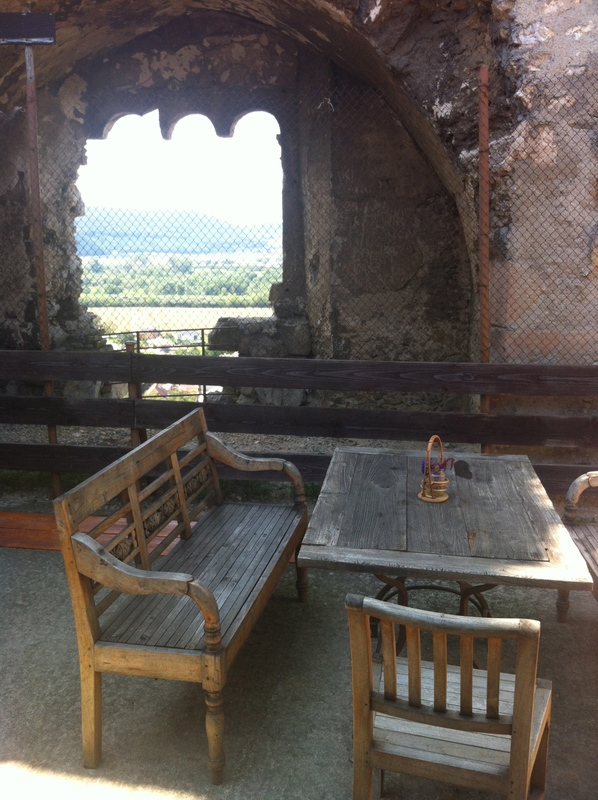 RELATED POST: One of our Top Ten Places to Stay in Slovakia is also in Košiarska – coming soon! Štefánik was born in 1880 when Slovakia was still very much a rural extension of the Austro-Hungary. And Košiarska was strongly influenced by the Hungarian part of the Empire, where Štefánik’s intensely pro-independent Slovakia views didn’t go down too well. So whilst his childhood was here and in the surrounding hills, his formative years were in Prague (where he studied, and met during lectures the future first President of the new Czechoslovak state, Tomáš Garrigue Masaryk, who gave Štefánik the idea of Czech-Slovak cooperation in a struggle for independence). Subsequently Štefánik was in Paris, where he rose to prominence at the Observatoire de Paris: here he honed his talents for astronomy and was soon being sent on astronomical/diplomatic missions by France around the world. The diplomatic skills, particularly, would serve him well. In 1916, with Masaryk, he formed the Czechoslovak National Council, the official resistance of the Czechs and Slovaks during World War One to Austria-Hungary – a body which won the respect and support of the Allies, and was recognised, after the Allied victory, as the platform for the new government of Czechoslovakia. Štefánik’s combination of military bravery and diplomacy were integral to getting Czechoslovakia recognised internationally as an independent nation. As is so often the case with bright young things (the man was only 39 at the time of his most untimely death) Štefánik’s end is more remembered than his beginning. Along with the three other passengers of the plane that was carrying him from Italy, where he was engaged on business, to Bratislava, he crashed, fatally, just outside the city on May 4th 1919. He had been returning home because he wanted to see his family. And he barely lived to see the Czechoslovak state he had fought so hard to create come into fruition. Of course, there is a chance that had Štefánik lived he would have become an embittered old politician prone to corruption, just as there is a chance James Dean would have developed gout and flatulence and rapidly made people forget what a heart-throb he had been. Unsurprisingly, this is not a school of thought Slovaks subscribe to. On the contrary, Štefánik is perceived as a great, a fighter and a diplomat, a man that commanded respect, who was plucked from this world far too prematurely. And that air crash in 1919 had aftershocks throughout Slovak culture that resonated far further. First: a wariness that the Czechs, in any potential dual state, sought only to further their own interests and not consider Slovak ones – Czech involvement in Štefánik’s death is the source of much debate. Second: a Slovak apathy towards almost all politicians that would claim to represent them during the following century – Štefánik left behind him a void unfilled to this day). What does live on is his memory – enshrined in what is doubtless Slovakia’s finest monument. The location alone lends it a certain poignant grandeur. From Košiarska the road (one of only four, incidentally, to transect this wild hill range in over 100km) bends down into otherwise unremarkable Brezová pod Bradlom, the main settlement hereabouts, from where another lane corkscrews up onto the forested ridge that looms above the town at 543 metres. But the trees on the crest of the ridge have been cleared, and so the Mohyla Generála M.R Štefánik (tomb to General Štefánik) is visible from afar. It is a bizarre structure, as monuments in Slovakia go. It was designed and constructed during the years following Štefánik’s death – completed in 1928. This three-level stone pyramid flanked by obelisks at each corner harks of the Mayan temples of Mexico and Guatemala and is a striking sight indeed in the north Slovak countryside. The architect was Dušan Jurkovič (generally considered the greatest Slovak architect ever, and also responsible for the cable car up to Lomnický štít in the High Tatras). The top of the monument (up which you can climb) yields tremendous views both back over the Small Carpathians and forward to the Biele Karpaty/White Carpathians. At the north-eastern end of the Small Carpathians that roll all the way southwest to Bratislava, Bradlo sits at something of a terminus of hiking trails – or a starting point for hiking trails, depending on your perspective. So the red-marked Štefánikova magistrála heads southwest from Bradlo, while the red trail continues northeast from here too, in the new guise of the Cesta Hrdinov SNP (trail of the heroes of the Slovak National Uprising – a trail which continues all the way across Slovakia to Dukla Pass in the far north-east (total hiking time Devin Castle-Dukla Pass 28 days). Meanwhile, a green trail runs due east from Bradlo and connects after 25 minutes of walking with a little connecter trail down to Košiarska, for those that are interested in seeing Štefánik’s birthplace/museum via a more interesting route. 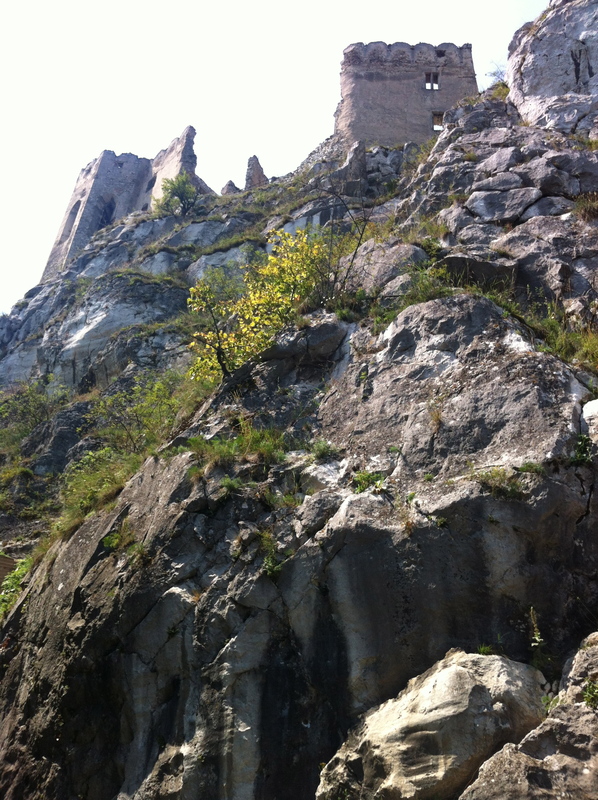 Three to four days of hiking from Bradlo on the Štefánikova magistrála gets you to Devin Castle, just the other (western) side of Bratislava. But there is one final place you should visit to truly honour one of Slovakia’s most revered all-time heroes. And that is somewhere almost every visitor to the country inadvertently does visit: Bratislava’s airport (!). The airport is in fact called the MR Štefánik airport, but the title goes beyond mere words. It was near Bratislava, after all, that Štefánik died in that plane crash in 1919. And just before security on the upper floor of the airport – just before you depart Slovakia into international airport space – there it is, suspended above you: a faithful replica of the Caproni Ca.3 in which Štefánik had his fatal accident. MORE ON CZECHOSLOVAK MILITARY HISTORY: There are two very informative military history museums in Slovakia which elaborate further on this subject – in Piešt’any (Western Slovakia) and in Svidník (Eastern Slovakia – and very soon due a post. OPENING HOURS: The monument at Bradlo is always open. These days, at least. There was a time when this was not so. For reasons which have yet to be fully explained to me (I am guessing due to a Soviet fear that allowing access would create strong feelings of nationalist sentiment), during Communist times – until 1968 – Bradlo was closed to the public (although it had been finished for some 40 years). In 1968 this changed when hundreds and hundreds of people descended on Bradlo (my ex-girlfriend’s father included) to voice their opinion that people should be allowed to visit the monument freely to find out about Štefánik and properly honour his memory. NEXT ON THE JOURNEY: From Bradlo it’s a 35km drive southeast to Piestany’s best spa on the Kúpeľný ostrov (Spa Island).